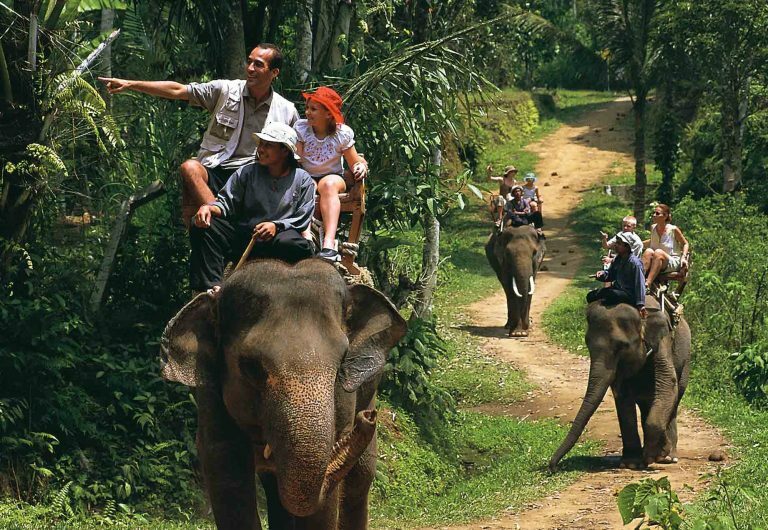 There are a lot of options for Elephant rides in Bali. From a short visit and picture taking with the friendly mammals to a more interactive elephant trek as you see how the animals are fed, bathed and trained. 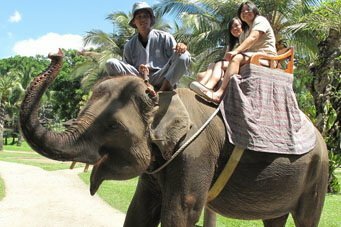 Enjoyed by children and adults of all ages, the Bali Elephant ride is a fun, safe activity for those who want to get close to the large animals and learn more about them. Elephants in Bali are protected as encroachment and habitat are endangering their natural home in Sumatra. Bali Trekking Exploration encourages healthy and humane care for all animals of our wonderful country. There are three parks from which you may choose. After you register for this activity, we will help you decide which park is right for you. Bali elephant camp has three session, one in the morning, noon and evening. Reaching the camp, you will arrive to a welcome drink at the Trunk Mahout Café. You can watch these beautiful beasts as they bathe while learning about the daily life of a Sumatran elephant. After the welcome ceremony, enjoy a brief elephant show before you schedule your ride. Our driver will take you to the Bakas Klungkung regency where you’ll be able to enjoy an elephant ride trek of 15 or 30 minutes or for as long as 60 minutes in the beautiful countryside and interior of Bali. Elephant Safari Ride tour begins at the village Taro. Here, you’ll not only get to ride the elephants for 30 minutes at a time, but you can view the Safari Park museum and see the skeleton of the elephants ancestor, the Wholly Mammoth. These elephants are rescues from the island of Sumatra where their habitat is slowly disappearing due to increased burning of their land and the farming of palm sugar oil. The Safari Park has other exhibits and animals such as zebras and rhinos. Tips are not required, but are always appreciated if you have enjoyed your experience and our service has exceeded your expectations. We try to accommodate your cancellation requests as best we can, but please note that the fee is nonrefundable if you cancel on the day of or day prior to your trek. This is because we have made other commitments and schedule arrangements that cannot not be changed. We apologize for any inconvenience this may cause. Pick up times will be arranged with you after regsitration. Are children allowed to ride the elephants? Yes, children of all ages can ride the elephants. How are the elephants treated? As far as we can tell, the elephants are treated well, but nobody knows the conditions from which they came, nor the conditions behind closed doors. We encourage you to ask the trainers about breeding, living conditions and training when you arrive. The elephants have been trained and are safe for humans to ride. What happens if someone gets injured? Due to our extensive safety procedures and experienced guides, injuries rarely occur. In the rare case that there is an accident, our guides are trained in basic first aid and evacuation procedures. After first aid has been applied, an injured person will be cared for appropriately. In the case of evacuation, the river rescue team will help get the guest to the nearest hospital where the next of kin will be notified. 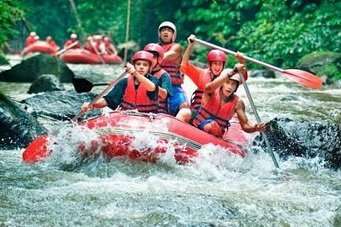 Choose from either thrilling Class IV rapids or a lazy float downstream with the family. Feel the powerful 250cc Quad for some off road filthy fun with our guided ATV rides. Ride a protected Sumatran elephant. Great fun for the whole family. 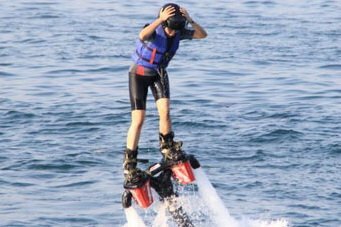 Let us introduce you to water sports of all kind. Bali is the place to get wet.